UNITED NATIONS, November 8 -- In the run up to November 28 elections in the Democratic Republic of the Congo, the UN Security Council held more than two hours of closed door consultations on Tuesday and emerged with a statement to the Press. As Permanent Representatives trickled out throughout the afternoon, Inner City Press asked them if the pro-Kabila duplicate voting records scandal detailed in leaked report by Belgian firm Zetes had been discussed. No, most of them said. The point of the meeting seemed to be to condemn opposition candidate Etienne Tshisekedi for threatening violence and even declaring himself the winner in advance. When top UN envoy to the DRC Roger Meece, formerly the US Ambassador to Kinshasa, came out to take questions, Inner City Press asked him about the Zetes scandal. Despite detailed media reporting on October 29 quoting long time Congo experts expressing concern about the duplicates, Meece minimized the issue. Meece told Inner City Press that it only impacted 120,000 registrations out of 32 million. Inner City Press asked if these was a double standard, having in mind the fight over hanging chads in the Bush - Gore fight in Florida. But worse is that while Meece knew about the Zetes report, apparently the Ambassadors on the Council, and even usually well informed staffers, were not. What is the purpose of such two hour closed door meetings? The UN has previously told Inner City Press that the US military advisers being sent to help track down Joseph Kony of the Lord's Resistance Army are NOT coordinating with MONUSCO. Inner City Press asked Meece, who said he thinks Kony is in the Central African Republic, where MONUSCO cannot go. Inner City Press asked if any International Criminal Court issues have been discussed. The US fought to get an ICC exemption in the Libya resolution earlier this year. But the LRA, with Kony and other leaders indicted by the ICC, operates in ICC member states. Would the US be subject to ICC jurisdiction. Ask the US, Meece said. 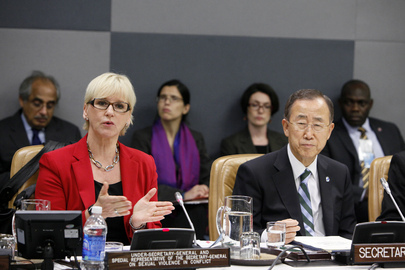 The UN's Sexual Violence and Armed Conflict expert Margot Wallstrom also came out to take questions. Inner City Press asked her where Serafim, a commander charged with the Walikali rapes with which Meece's tenure began, is now. She said she did not know. She did however describe some of the work of trying to "name and shame" such commanders through the DRC Sanctions Committee. Whether international travel bans will root out the problem is another issue. An overarching problem is the UN seeming to take sides in elections. Regarding the upcoming elections in Egypt, Inner City Press on November 8 asked the spokesman for Secretary General Ban Ki-moon to confirm that Ban is meeting with Egyptian candidate Amre Moussa, and why. The spokesman Martin Nesirky said he didn't know. When the Security Council ended after six o'clock, Ban's spokeperson's office had still not provided Inner City Press with any answer. But Moussa is on Ban's schedule for November 9. Will Ban meet with any other Egyptian candidates? A similar critique can be made of the UN's work in Liberia. Watch this site. Footnote: Inner City Press asked Wallstrom if she thought what happened to Gaddafi after he was captured amounted to sexual violence. She said that it did, but that the ICC (and presumably not her office) will be pursuing the issue. We'll see.